Born 1959, Dr. and Professor of Political Science and Military Law at the University of Skopje, Macedonia. She also teaches at Peace Program and European Studies Program at the Faculty of Philosophy in Skopje. She is a member of numerous international associations, such as: ISA, IPRA, IPSA, IUS. She is a member of the Executive Board of IPSA/Research Committee on Armed Forces and Society. Her research and teaching focus is on civil-military relations, Balkan security, international relations and peace research. 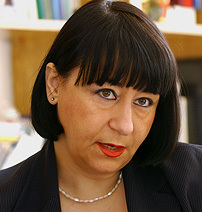 Dr. Vankovska joined the TFF as Associate in 1999. They kill children too, don't they? What an absurd idea that Iraqis shall come to Macedonia to be tought how to protect themselves and do crisis management! Are there any limits to the hypocrisy and to how far Macedonia will go to be allowed into NATO?